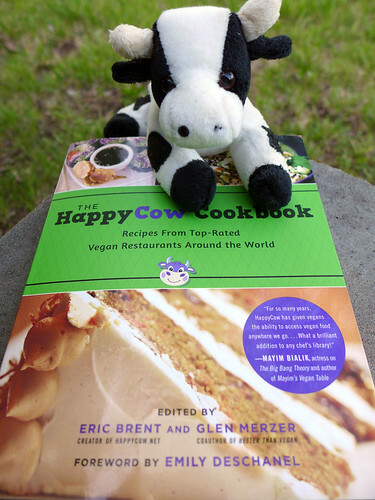 If you don’t own a copy of The Best Veggie Burgers on the Planet, you are seriously missing out. Exhibit A: this Bacon Cheeseburger from the Heartland. “But where’s the (vegan) bacon and (nondairy) cheese?” you’re probably asking yourself. IT’S BUILT RIGHT INTO THE BURGER. I just blew your mind, right. Well, technically it doesn’t come out until June 3rd, but I was lucky enough to score a review copy. (Thanks again for that, BenBella books!) I have literally been waiting for this cookbook to drop for eight months now, no lie. Maybe more. (My memory ain’t what it used to be.) Now that it’s here, it does not disappoint. Although a real, live chef to recreate all these masterpieces would be icing. Topping my to-do list: the Buddha Lentil Burger from Buddha Burgers; El Piano’s Peruvian Leftovers Pie (though I’ll need to generate some leftovers first! ); the Canelones de Seitan via Mi Vida; Peacefood Cafe’s Roasted Spaghetti Squash, Cauliflower, Garlic, and Mashed Potatoes with Porcini Mushroom Gravy (say that five times fast!) and its Award-Winning Chickpea Fries; and the Enchilada Pie from the awesomely named Stuff I Eat. There are also some pretty bitchin’ zerts here – Chocolate Raspberry Hazelnut Cake, Gluten-Free Coconut Strawberry Shortcake Cupcakes, and Key Lime Tarts, oh my! – but idk if my pants can stand any more sweets. Not with ice cream season upon us. But wait! Before I get ahead of myself. 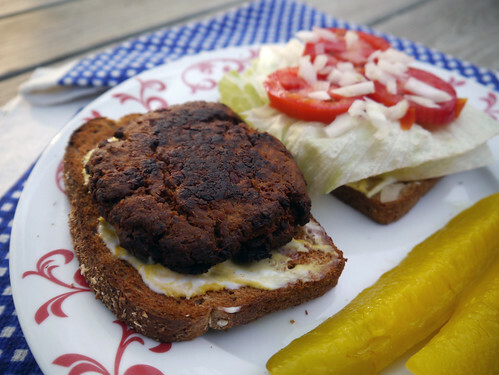 I started with the Quinoa Patties (contributed by Green Cuisine in Victoria, BC), both because they sounded tasty and seemed pretty easy to whip together in a pinch. Plus I had all the ingredients on hand, so bonus. 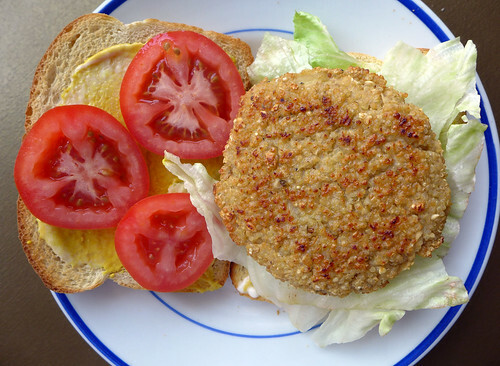 The good news: The Quinoa Burgers from Mayim’s Vegan Table are bangin’. The bad news: The recipe requires a little finagling to make it work. So I followed the recipe as directed – it’s pretty simple, with just seven ingredients – but my burger batter came out way too wet and sticky to handle. 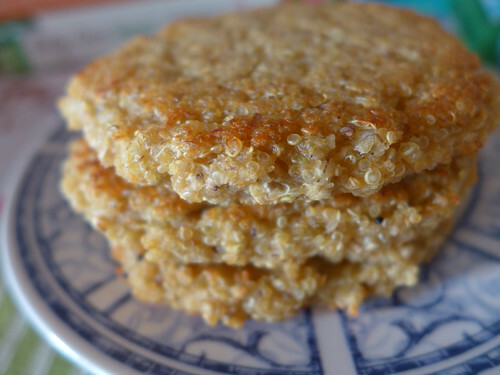 I ended up adding 1/4 cup of flour and between 1/4 and 1/2 cup of quick oats before I could shape it into patties without half the quinoa clinging to my phalanges. Then you’re supposed to fry the patties and bake ’em a little longer. Instead, I went right to the baking portion of the directions: 425F for 30 minutes (20 minutes on one side and then flip) on a lightly greased cookie sheet. I figured it’d be both easier and healthier, and I think I was right on both counts. Also weird, but not necessarily in a bad way: I ended up with nearly double the burgers I was supposed to. Anyway, I could only fit five patties to a cookie sheet, so I had a little extra batter left over. The next day we had a mini pizza party for Easter (and because it was Sunday. And 4/20. Basically we don’t need a significant reason to enjoy pizza, is what I’m saying. 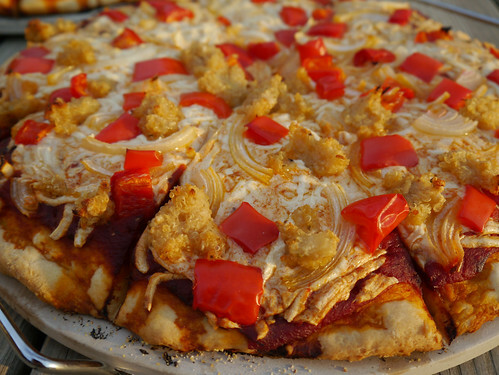 ), and I spooned some of the batter onto the Daiya mozzarella and onion pizza. Soooooo good, y’all! I think I like this even better as a pizza topping. 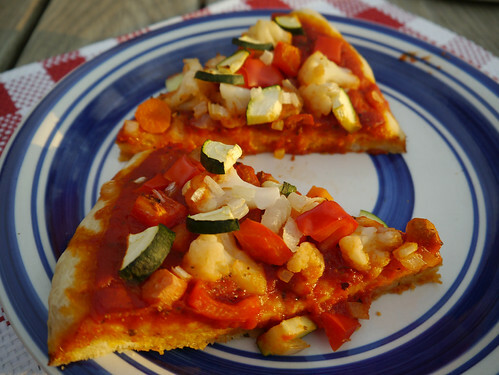 We also took the pizza crust recipe from Mayim’s Vegan Table for another spin. The first time around, it didn’t bake all the way through; instead, it remained a little dense and doughy. Chalk it up to bad yeast or wacky weather, but the crust came out much better on our second try. Yay! 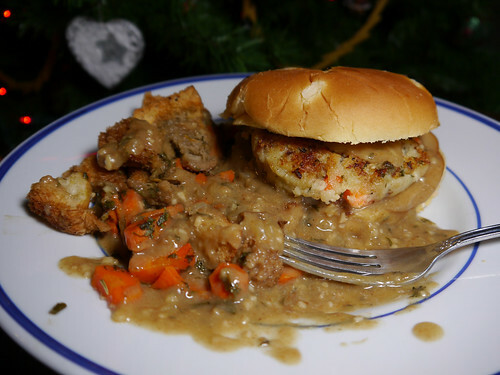 Normally I wouldn’t bother blogging my leftovers – but seeing as the gravy’s a new recipe, let’s have a gander, shall we? Naturally, the gravy was the first of the Thanksgiving foodstuffs to go. 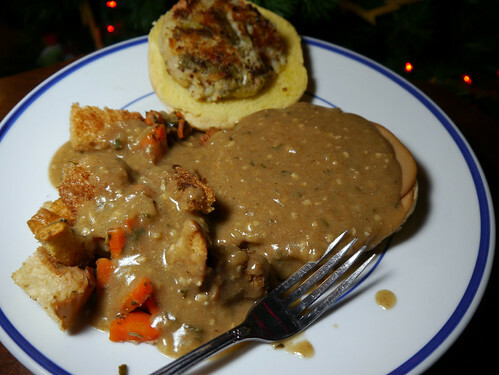 But mashed potatoes and stuffing just aren’t their best unless they’re drowning in gravy – so for the leftovers, I made a double batch of Homestyle Gravy from Tamasin Noyes’s American Vegan Kitchen. It was fairly easy to make (it’s gravy! ), but super-tasty. A very high nom-to-effort ratio, is what I’m saying. With tons of seasonings – including soy and Worcestershire sauce – it’s definitely one of the more flavorful gravies I’ve tried. You can see all the yummy bits in the above photo: onions, garlic, rosemary. Too shy to make an appearance: thyme, nooch, and sage. This year’s dinner was so amazing that I’m finding it hard to say goodbye. Until next time, Thanksgiving Burgers. I will see you in my dreams. Alternate title: The Obligatory Post-Thanksgiving Food Post. Since it was just the two of us – and an exhausted and otherwise occupied pair of cooks we were, at that – Shane and I didn’t go too overboard with this year’s food festivities. It was business as usual for most of the day, and then in the evening we made Thanksgiving dinner. 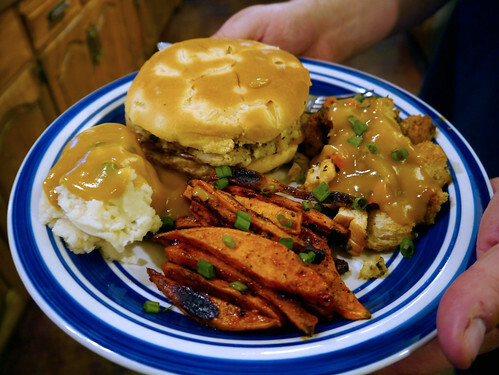 The main course: Straight-Up-Thanksgiving Burgers (recipe via evil junk food genius Joni Newman), topped with Hickory Smoked Tofurky slices and gravy and served on toasted onion rolls. OMG y’all, these burgers are AMAZING! They’re vaguely reminiscent of the fried mashed potato patties my mom used to make (in a futile attempt to get us kids to eat up the leftovers. In retrospect, I have no godly idea why we’d shun leftover mashed potatoes in the first place. Kids, who needs ’em. ), only infinitely better. 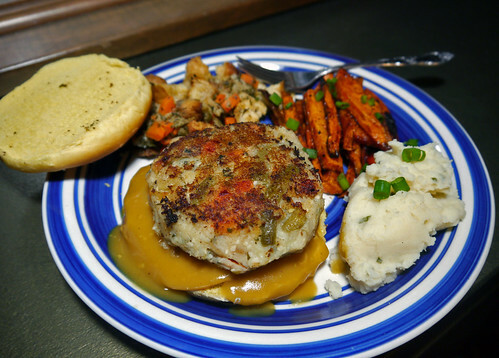 In addition to mashed potatoes, the burgers are mashup of stuffing, green beans, and French’s fried onions. SO NOMMY. 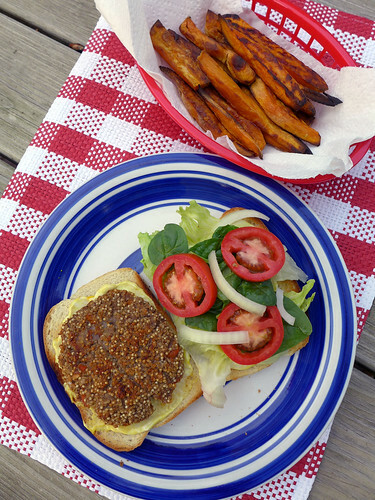 We halved the recipe, fried up two patties, and then set the leftover batter aside for later. I reckon we’ve enough left for three or four more burgers. 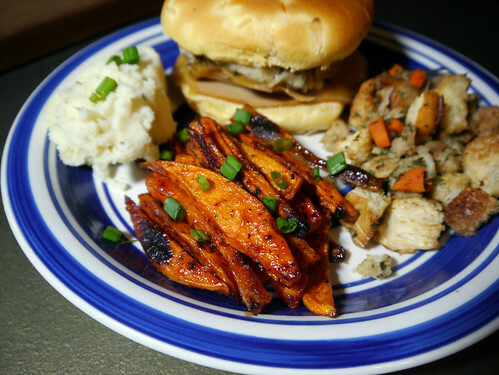 On the side: extra garlic & chive mashed potatoes and stuffing (my own recipes), as well as Hunan-Style Baked Sweet Potato French Fries with Chili Sauce (recipe via the upcoming The Chinese Vegan Kitchen, which I’m in the process of reviewing). The fries? Off the cuff! (Kids are still saying this. I’m not asking, I’m telling.) You bake ’em halfway and then fry them to finish. During the last few minutes of cooking, they’re coated in this delicious ketchup-soy sauce-chili paste concoction that’s finger-licking good. Though I must admit that I only used a quarter of the recommended chili paste, since I can’t handle hot foods very well. Shane thought they needed more chili paste, but he also thought we needed pie to wash down all those carbs. WHAT DOES HE KNOW? I accidentally ate so much that I felt like I was going to die. I seriously had to swap my pants for a bathrobe. And we’re not talking jeans here – sweat pants! That’s how stuffed I was. Probably it didn’t help to snack on fried onions while I was making dinner. My only regret? Aside from the chest pains, that is? I didn’t have any room left for soy chai ice cream. Homemade, yo!